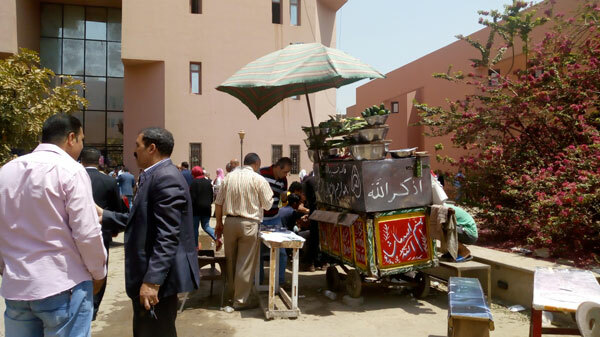 At 11am on Wednesday at the Egyptian National Arts Academy’s High Institute for Folk Arts (HIFA), a breakfast buffet of traditional Egyptian food kicked off the country’s first nationwide heritage week. In collaboration with 14 culture- and heritage-affiliated government organizations, the ministry of culture has organized this inaugural week in celebration of World Heritage Day. Previous heritage celebrations in Egypt have rarely extended to heritage beyond the country’s historical past. The ministry of antiquities has usually opened all national museums for free on World Heritage Day, but this year, the celebrations extend to the country’s non-tangible heritage, explained Nahla Emam, professor of traditions at the HIFA -- and the woman behind this year’s event. “The idea is to reproduce folk heritage as well, to bring it to the people, like we did inside the institute today. The foul vendors were not so sure if faculty members would appreciate them as traditional foul makers, but they did. You see that's what Egyptians usually do during the month of Ramadan: we revive our heritage. Today we did the same thing," she explained to Ahram Online. The morning’s celebration included a hand full of artistic events. 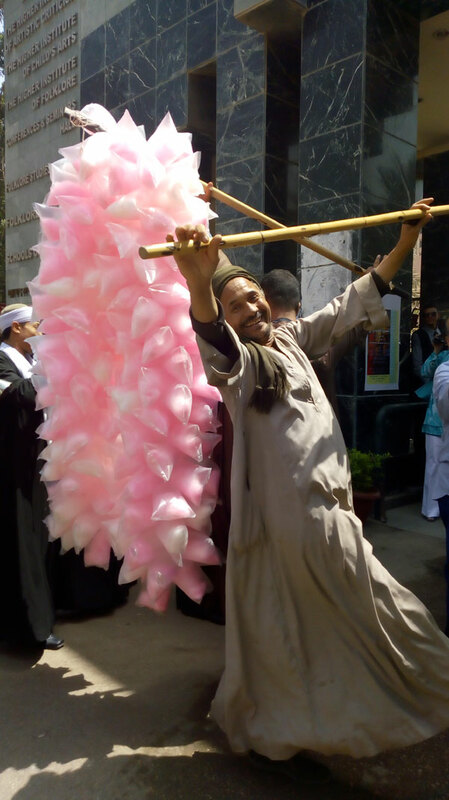 It started out with a Tahteeb (stick art) performance by the talented Sabri Mahmoud and his troupe from the International Center for Stick Arts in Sohag, first established in 2012. "The celebration includes a photography exhibition of the students of the HIFA, as well as several performances that includes folk arts and music," explained Mohamed Shabana, professor of folk music and one of the day’s organizers. For regular passersby, stick dancing to the rhythms of folk music was a celebration of its own. The academy’s students then came to watch Am Saber Egypt's oldest Aragouz player. Among the audience were prominent faculty professors as well as Ahlam Younis, director of the National Arts Academy. 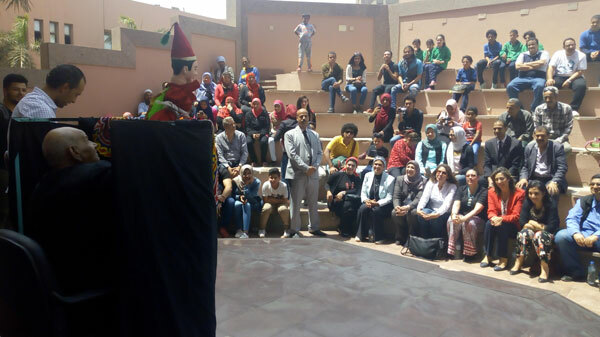 "Egypt’s National Arts Academy greets the world on Heritage Day and shall add this day to its annual calendar from now on," she told Ahram Online. Concluding the morning’s celebration was an enchanting performance by Al-Tanboura folk troupe. 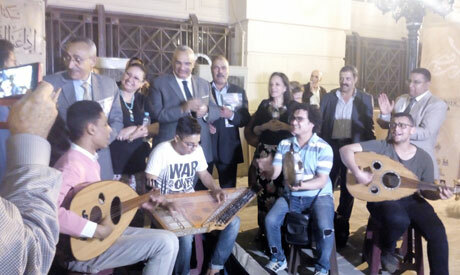 That evening, at 6:30pm, the head of the National Organisation for Urban Harmony Mohamed Abu Seida and the governor of Cairo launched Cairo’s first “Art Street” at the Al-Borsa Street. 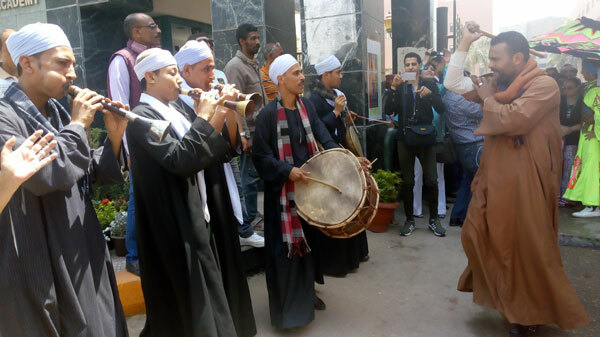 Young musicians chanted folk songs by Said Darwish and Om Kalthoum against the backdrop of the old National Broadcast building, invoking memories of a golden era that is still celebrated by the new youth generation – quite a sight. The pedestrian area the subject of a joint project to transform it into a free art space for young Egyptian talent, explained Tarek Atia, member of the Cairo heritage development committee that was created by a presidential decree in 2016. The committee aims to revive Cairo’s heritage districts with a holistic approach. And the celebration continues: For more information of events of the National Heritage week pls click here.